will hold about 25 adults with no problem ! solid wood floor and walls , clean bathroom with t.p. , hand sanitizer , paper towels , roof over whole float , spare tire , fire extingusher , first aid kit . jack , tire tools , removable pegs ! can be painted or decorated any way you want ! bumper pull , twin axle , working tailights ! 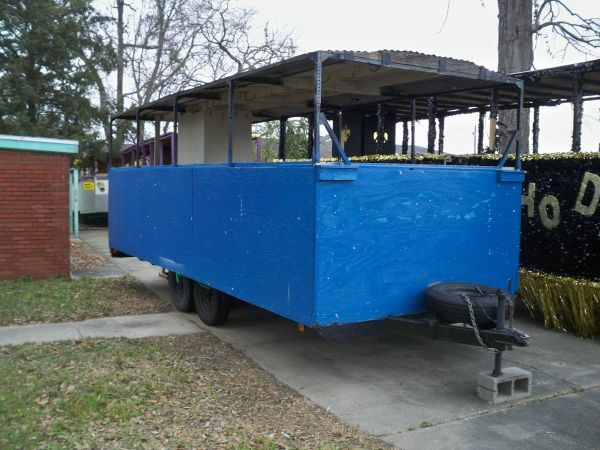 $ 200.00 cash deposit , returned when trailer is brought back in good condition . 225 - 454 - 8512 NORMALLY $ 500 rental for christmas parades BUT , i do need a riding mower RUNNING , and a decent fridge , also looking for a good camera / security system or MAYBE ? ? ? Location: N.B.R.